Christy Walker M.D. (Plano) - Book Appointment Online! Proudly serving the Plano and surrounding areas! 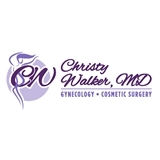 Dr. Christy Walker is DFW’s only Gynecologist who is Fellowship trained in Cosmetic Surgery. Dr. Walker believes women’s empowerment is closely related to her health and beauty. Her unique skillset of gynecologic surgery coupled with expertise in facial aesthetics and cosmetic surgery allows her to address cosmetic, gynecological and vaginal surgical concerns. She’s an amazing doctor I would highly recommend her.